Celebrate the end of the UMD semester, whether you are a student, staff, faculty, or neighbor! 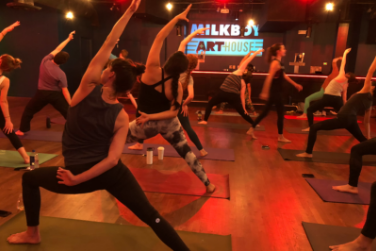 Join Yogi Terps and Numi Yoga for a Glow Flow at MilkBoy ArtHouse. There'll be glow sticks, music, and the flow. Enjoy special happy hour pricing on drinks and snacks available after class. There'll be some mats there to share but please bring your own (or a towel) if you have one!